Fireworks, Beer Festivals, Road Races, and More! 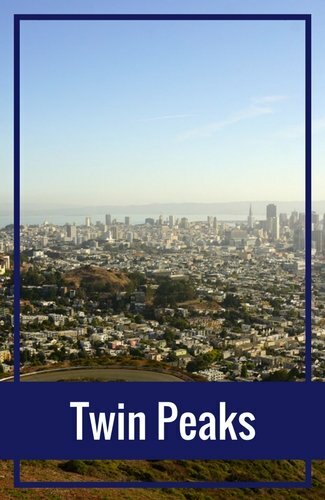 You will find dozens of fun events each week in SF. However, there are a few that stand out above the others. 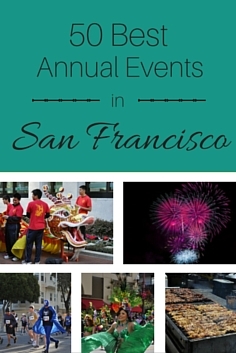 This list features 50 of the best annual events in San Francisco. It includes everything from wine tasting events to road races and everything in between. Click the event name below to learn more details about that specific activity. 1. NYE Fireworks Over the Bay: Start the New Year right by heading down to the waterfront, near the Bay Bridge and the Ferry Building, for the New Year's Eve Fireworks display. It starts at 11.59pm on New Year's Eve. 2. 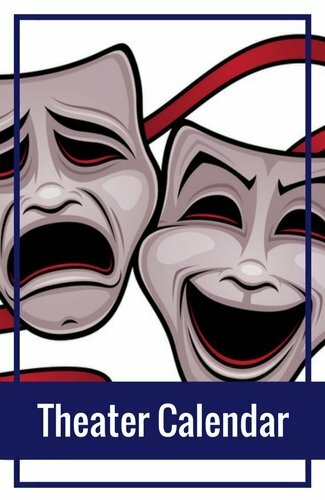 SF Sketchfest: Enjoy two weeks of comedy performances all around SF at this annual comedy festival in January and/or February. 3. ZAP Wine Festival: Sample new Zinfandel wines at the annual ZAP Wine Festival. It's held at the beginning of the year in either January or February. 4. SF Giants Fan Fest: Celebrate with the SF Giants during Fan Fest at Oracle Park (formerly AT&T Park). It's a full day of autographs and family-friendly activities. You can also pick up tickets for any home games or buy gear for the upcoming season. This event is in February. 5. Chronicle Wine Tasting Event: Another popular February event is the Chronicle Wine Tasting Event. It's the largest competition of American wines in the world. It's at the Fort Mason Center. 6. Chinese New Year Parade: The Chinese New Year celebration offers a full month of activities. The most popular is the Chinese New Year Parade. The event follows the lunar cycle, so the date changes each year. It is in January, February, or March. 7. Pacific Orchid Expo: The Pacific Orchid Expo offers you the chance to see more than 150,000 orchids from around the world. You can buy orchids during the expo, learn more during a workshop, or help raise money at the fund-raising auction. This event is in February. 8. Craft Brew Festival: The Craft Brew Festival has two events each year. The first is in the spring, usually in March. The second is in the fall, usually around November. It's a great place to try new local, national, and internationally known craft beers. 9. SF Theater: Every year, you will find dozens of top theater performances in San Francisco. They include award winning productions such as Wicked, the Lion King, and the Book of Mormon. Almost any day of the week, you will also find small local productions at many of the theaters around SF. Performances run all year long. 10. 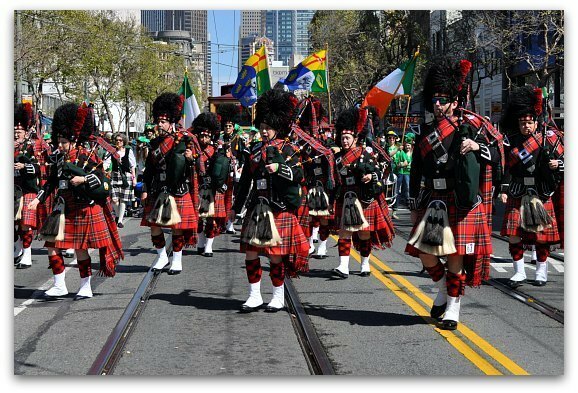 Saint Patrick's Day Festival & Parade: Head over to the Civic Center District for this year's Saint Patrick's Day Festival and Parade. The festival lasts from 11am to 5pm and the parade starts at 11:30am. It's always the Saturday before or after Saint Patrick's Day. 11. 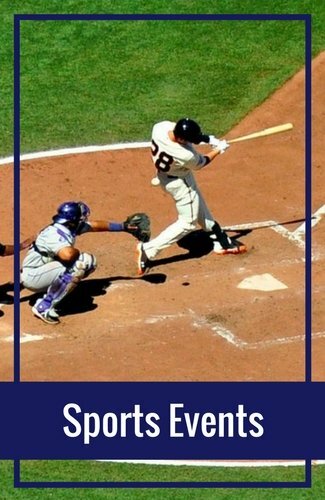 Giants Baseball: Opening day for the SF Giants is in April. They play 10 to 12 games at home every month through September. All games are at Oracle Park (formerly AT&T Park). 12. Cherry Blossom Festival: Admire the cherry blossoms during this two weekend long affair. 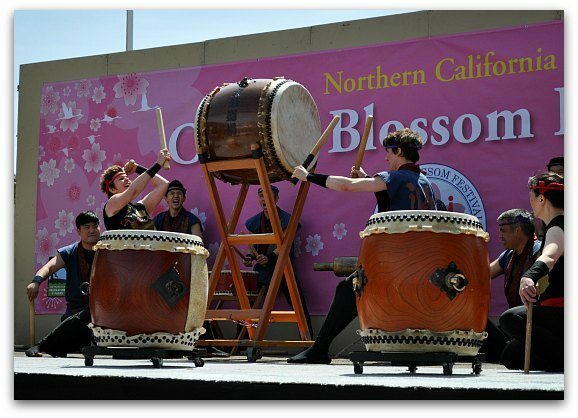 It's held in Japantown and offers traditional cuisine, music, and other entertainment. This event is in April. 13. San Francisco International Film Festival: One of the largest film festivals is held every April and May in San Francisco. The event features works from independent film makers from around the world. 14. Oysterfest: Savor oysters and listen to live music at Oysterfest. It's in the summer every year and is held in Golden Gate Park. 15. International Beer Festival: Sample beer and help raise money for a great cause at the International Beer Festival. It features brews from more than 100 breweries and all ticket proceeds go to the Telegraph Hill Cooperative Nursery School. It's in May each year. 16. Uncorked Wine Festival: Enjoy a weekend of sampling local wines at the Uncorked Wine Festival at Ghirardelli Square. During this event, you can also attend cooking demonstrations, listen to live music, and sample gourmet goodies. It's in May. 17. Bay to Breakers: Participate in a San Francisco tradition, Bay to Breakers. Whether you are running, walking, or just watching on the sidelines, you will appreciate the colorful, quirky costumes by other runners. This is in May. 18. Carnaval Celebration: On Memorial Day Weekend, head over to the Mission to celebrate Latin and South American cultures at Carnaval. It includes a two day festival with music, food, and dancing in the streets. The vibrant parade is on Sunday morning. 19. San Francisco Ethnic Dance Festival: Enjoy a month long celebration of dance from around the world at the San Francisco Ethnic Dance Festival. It's at various locations around SF in June. Save on Event Tickets: The best way to save on event tickets is through Goldstar. They offer tickets to many of the events on this page and many others that require you to pay for admission. 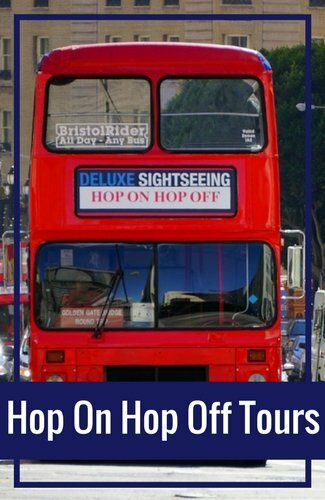 In addition, you will also find tickets for SF cruise, tours, and other fun activities at up to 50% off. Click here to check out their great discounts for your upcoming visit. 20. North Beach Festival: Listen to live music, sample local foods, and admire street art at the annual North Beach Festival. This two-day event is in June. 21. Union Street Festival: Another popular street fair in June is the Union Street Festival. It offers live music, wine tasting, a fashion show, and almost 200 arts and crafts booths. 22. Pinot Days: Uncover new Pinot wines at Pinot Days in November. 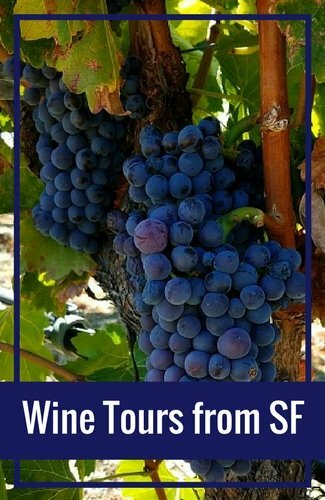 This wine tasting event only serves up local and international Pinot Noir wines and is usually held at the Metreon. 23. Stern Grove: Listen to free music in the park every Sunday afternoon at 2pm between mid-June and mid-August. You will find everything from world renowned artists to local favorites. 24. Escape from Alcatraz: This triathlon starts with a swim from Alcatraz to the shores of San Francisco. It then includes a bike ride and run around the hilly streets of SF. It's every June. 25. Juneteenth: The Juneteenth event celebrates the abolition of slavery with a one day festival. It's held on Fillmore Street every June and features live music, an auto show, and a health and wellness pavilion. 26. Pride Parade & Festival: Celebrate the LGBT community at this lively festival and parade. This two-day event is in the Civic Center District near City Hall. The well attended parade is on Sunday morning starting at 10:30am. 27. 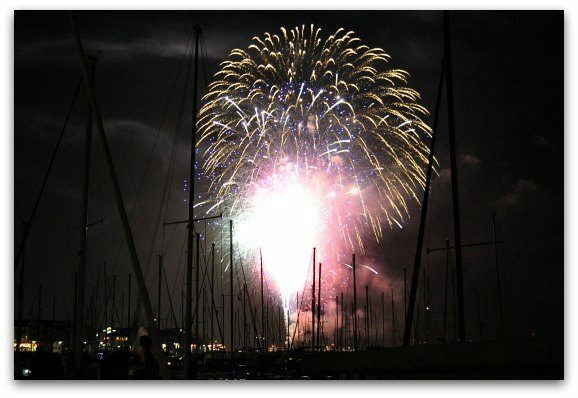 Fourth of July Fireworks on the Bay: Watch fireworks over the bay just after dark on Fourth of July. You will find them along the northern waterfront near Fisherman's Wharf. 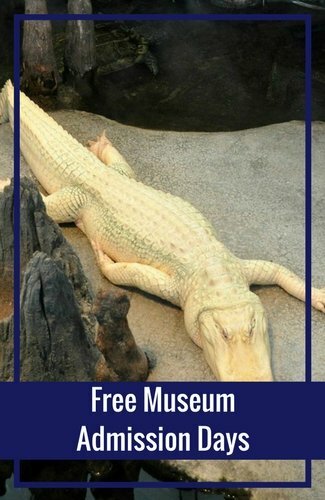 Stop by earlier in the day to enjoy other family friendly activities and live music. 28. Fillmore Jazz Festival: One of the biggest jazz festivals in the US is the Fillmore Jazz Festival. It's held the weekend of Fourth of July and offers two-days of free, live jazz music in the Pacific Heights District. 29. San Francisco Marathon: Run through the streets of San Francisco during this annual marathon. It's every July. 30. Outside Lands Music Festival: The largest music festival here is Outside Lands. For three days, thousands of music lovers enjoy live music in Golden Gate Park. It's in August. 31. Eat Drink SF: Savor delicious cuisines from top local chefs at Eat Drink SF. It lasts for four days in August. 32. 49ers Football: Cruise south of the city to catch a San Francisco 49ers game in Levi's Stadium in Santa Clara. Pre-season starts in August and the season ends in December. 33. Craft Spirits Carnaval: The Craft Spirits Carnaval is a place to sample handmade, premium spirits from independent distillers. On hand, they will have Bourbon, Whiskey, Tequila, Vodka, and more. It's every August at the Fort Mason Center. 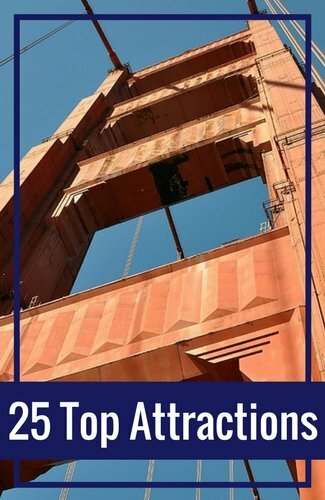 Top Hotels in Fisherman's Wharf: Are you looking for a great place to stay? Make sure to check out these top rated options in Fisherman's Wharf. 34. Comedy Day in Golden Gate Park: Laugh the day away at this free comedy festival in Golden Gate Park. For one day, local comedians give back to the community for their support throughout the year. It's in September. 35. Ghirardelli Chocolate Festival: Sample Ghirardelli chocolate in Fisherman's Wharf in September. The event not only features chocolate, but also includes cooking demonstrations, wine tasting, and more. 36. A Taste of Greece: Savor traditional Greek cuisines including Spanakopita, Mousaka, Kotopoulo, and Gyros. This three day event is at the Annunciation Cathedral in the Mission every September. 37. Fall Antiques Show: The Fall Antiques show hosts 60 dealers with high-end antiques from the US and Europe. Items include silver, jewelry, ceramics, glass, furniture, and much more. It's held in the Fort Mason Center in October. 38. Oktoberfest by the Bay: Celebrate Oktoberfest this September in San Francisco. This three-day beer festival features German traditions including brews, food, and music. It's held at Pier 48. 39. Hardly Strictly Bluegrass Festival: Listen to free, live music at Golden Gate Park this October. Hardly Strictly Bluegrass is three days of music from both internationally recognized and popular local artists. It's held in Golden Gate Park. 40. Castro Street Fair: Have fun the first weekend in October at the Castro Street Fair. This long running festival includes live music, dancing in the streets, and some of the most colorful characters you will ever meet. 41. 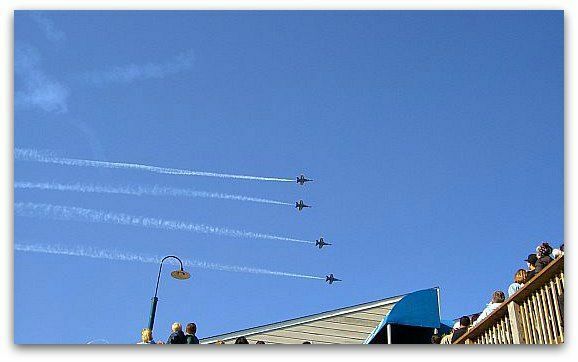 Fleet Week: Spend the weekend along the waterfront during this October's Fleet Week. The event includes a large airshow that ends with the Blue Angels, the chance to hop aboard a military ship to learn more about it, and plenty of live music, food, and fun. 42. Open Studios: Step inside local artists' studios on this four weekend long event. Each weekend, a new set of artists in certain districts open their doors to the public. You can buy unique pieces and talk to the artists about their craft. 43. Treasure Island Music Festival: Head over to Treasure Island for this two day music festival. In addition to live music, you will find plenty of food, drink, and interesting activities to keep you busy all weekend long. It's usually in mid-October. 44. Litquake: Discover two full weeks of literary events during Litquake. It includes everything from author panels to workshops on how to write. It's typically in October. 45. Wharf Fest: Stop by the waterfront in Fisherman's Wharf for Wharf Fest. The one-day event includes a chowder tasting competition, live music, and other fun events. It's usually toward the end of October each year. 46. Boo at the Zoo: Throw on your favorite costume and spent some time watching the animals play at Boo at the Zoo. It includes activities such as Pumpkin Chomp N' Stomp with the animals, a visit from Casper the friendly ghost, and trick or treat stations. 47. SF International Auto Show: Check out next year's top models at the SF International Auto Show at Moscone Center every November. It features 38 of the world's top car manufacturers displaying their new cars, SUVs, and trucks. 48. Union Square Holiday Tree Lighting Ceremony: Celebrate the season at the Union Square Holiday Tree Lighting Ceremony. Every year, they erect a towering Christmas Tree in the center of Union Square. The tree lighting ceremony is the Friday after Thanksgiving at dusk. The tree is then lit every night though the end of December. 49. SF Ballet's Nutcracker Performance: The SF Ballet was the first US company to perform the Nutcracker in 1944. Each year, they offer several performances throughout the month of December. Stop by the War Memorial Opera House to take part in this holiday tradition. 50. SantaCon: Throw on your best Santa costume and stroll around San Francisco with thousands of others dressed in red and white. SantaCon is a non-political, non-violent, non-controversial day that is meant to be fun and entertaining for both the santas and those they run into on the streets.